This month, an overwhelming majority of voters supported the seven proposals to strengthen anti-graft measures during the anti-corruption referendum in Colombia. Even though the referendum failed to meet the quorum (1/3 of eligible voters), and is now in the hands of the Congress and President Duque, several lessons can be drawn from the participatory process that brought these proposals to the public agenda. In addition to sharing with you where have we been sharing the results of the LATINNO project this month, August's newsletter will feature the participatory means used to support the initiative for the implementation of a popular consultation on anti-corruption measures in Colombia, as well as other important citizen initiatives in Latin America. Seeking to create common knowledge between scholars who study representative institutions and those who conduct research on participatory democracy, LATINNO's project coordinator, Thamy Pogrebinschi, organized and chaired the roundtable "What Is the Role of Participatory Institutions Within Representative Democracy?" at the Annual Meeting of the American Political Science Association. When conceiving this debate, hosted by APSA’s comparative politics section, Thamy Pogrebinschi had in mind some concerns shared by the LATINNO project. For instance, overcoming the theory x empirical research divide and shedding a light on how participatory innovations can strengthen representation and improve democracy. In order to do that, she invited prominent scholars Scott Mainwaring, Archon Fung, Brian Wampler, Frances Hagopian, and Tulia Falleti to join this intensive and productive roundtable. This month, LATINNO's results were also presented at the European Consortium for Political Research, Europe's largest political science conference. There, the project's coordinator, Thamy Pogrebinschi, introduced the 23 new institutional designs for citizen participation identified in Latin America. The project's findings on the typologies of democratic innovations were presented during the panel Frontiers of Democratic Innovations. The Citizen Law Initiative for the Repeal of Law 840 of the Interoceanic Grand Canal project in Nicaragua was proposed by the National Council for the Defense of the Earth, Lake and Sovereignty - with the legal support of the Popol Na Foundation. The repeal initiative was presented to Congress, which rejected it immediately, and before the Supreme Court of Justice, in order to stop a project that, besides depriving a large number of local communities, will cause irreparable damage to the Ecosystem of the Central American country. 28,698 citizens signed the initiative to repeal the Law, which was accompanied by a strong social mobilization around the country. This citizen initiative took place in response to the attempt to repeal parts of the so-called "Expiry Law of the State Punitive Claim", an Amnesty Law for Crimes carried out during the dictatorship in Uruguay. The argument was that the law was inconsistent with international law and that the Constitution of the Republic could be the mechanism to ensure compliance with international law. 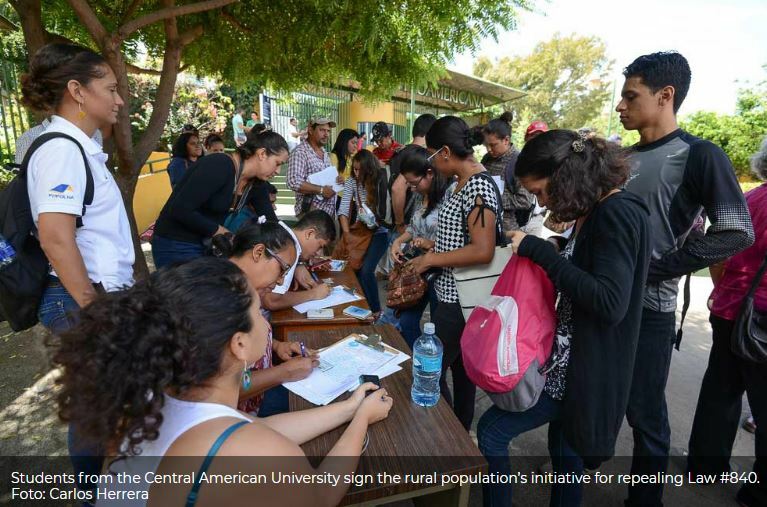 The initiative, led by civil society organizations and syndicates, gathered 60,000 signatures. The plebiscite was carried out, but only about 48% of votes obtained were in favor of the reversal of the law. 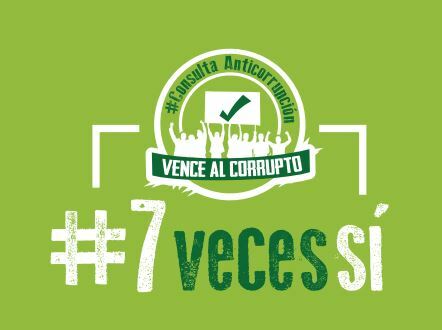 The citizens' initiative for the implementation of a popular consultation on anti-corruption measures was promoted by the political party Alianza Verde (lit. Green Alliance). It was supported by 35 thousand volunteers, who, during six months, disseminated information about the consultation and gathered 4,236,682 signatures in 460 municipalities of the country - making this the most supported initiative of the last decades in Colombia. In addition to collecting more than the necessary signatures to take this proposal to Congress, 5.8 million letters were sent to the senators, who voted unanimously in favor of the implementation of this Popular Consultation. The anti-corruption Referendum was carried out as a result of this well-supported citizen initiative. The popular consultation was a space where citizens could support or reject seven key points to fight corruption. These proposals included: reducing the salary of congressmen and state officials, eliminating alternative and special detention measures for officials incriminated in corruption scandals, implementing mechanisms for the promotion of transparency, establishing public budget oversight mechanisms, regulating the responsibilities of congressmen to improve accountability, scrutinizing unjustified property and income of public officials; and establishing clear limits for public corporations.